This is a modern rendition of the Lord’s Prayer, which I’ve renamed as Prayer to the Divine, this is intended to have the same positive healing and guiding effects upon your inner spiritual being for renewed aliveness, enjoyment, living and help with spiritual ascension. With this prayer, there isn’t the same feeling of unease or stigma due to connotations of religious Christianity and I understand that religion isn’t necessarily culturally compatible or desirable for everyone’s beliefs or lifestyle, but one may still live this way inwardly or within the heart without the need for overt external signs or spiritual displays. Initially for many, it will be necessary to actually speak this prayer through the spoken word out loud, however in time your soul or inner being that simultaneously functions both independently and in parallel with you will learn from this and begin to adapt and change inwardly as necessary and as a result it will help to bring about changes in your life that will help to lift your spirit, release depression and end any internal strife and states of suffering. At times this is done through inner learning or spiritual lessons and at other times you will be intuitively guided along in your life when you listen as you go about your day. I say now say this prayer either in the morning or right before bed when I have time to be still and reflect after doing it. When thought out loud with real conviction, belief and intention this prayer disperse ego energy like blowing off the dust from an old book cover. Some of this you can release through deep out-breaths, however for some things you will need to be patient and listen or perceive inwardly by closing your eyes and being attentive to any subtle inner communication, messages or insights which you can take down and act upon. Some ego includes minor or moderate issues to discern from and at later times you may hear or perceive still voices and softened guidance. 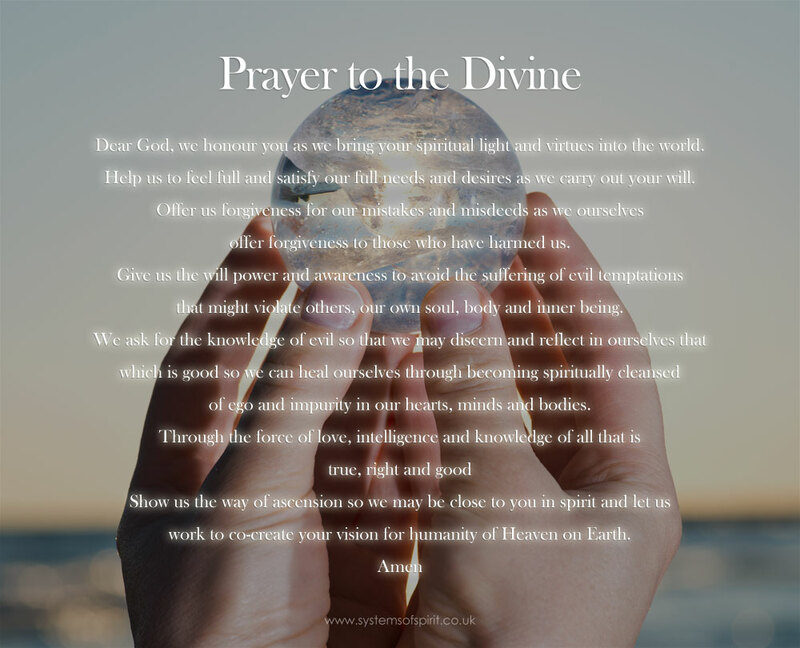 This prayer will actually help to facilitate a deeper spiritual awakening as purer spiritual energy begins to flow through you and removes blocks. The prayer begins working instantly through the intuition of the mind from within spirit and you will really see and feel the marked difference over the course of the month or even a year. Use daily for best results or incorporate into your existing yoga practice or during your meditations as and when you feel its needed. I edit and adjust this prayer from time to time in order to make it more succinct, sound clearer, be more understandable or more reflective of the help, guidance or needs of people collectively. Dear God, we honour you as we bring your spiritual light and virtues into the world. Help us to satisfy our full needs and desires as we carry out your will. As we seek to co-create your vision of Heaven on Earth. Open our eyes so we may see the truth. Offer us love and help us to heal ourselves through becoming spiritually cleansed of ego and impurity. Forgive our mistakes and misdeeds when we ourselves forgive those who have harmed us. We ask for the knowledge of evil so that we may reflect in our hearts that which is good. that will violate our own soul, body, consciousness and inner being. allow us to discern all that is true, right and good. Show us how to appreciate and experience the fun, joy, life and beauty in the world. Guide us through ascension so we may be closer to you in spirit. For thine is the Kingdom, the power, the glory, forever.